The Parkland shootings raised our nation’s consciousness about gun violence in ways that were previously unseen. That event and the ensuing national debate over gun control and responsible gun ownership was the catalyst for much discussion among colleagues, friends, and family for many of us. Most notable for me, however, was the ongoing dialogue with my two teenaged daughters. Like many of their peers, they tried to make sense of the senseless violence inflicted by yet another person with easy access to lethal weapons, the type of which went well beyond what should be available to any civilian. Beyond the dialogue, though there was greater a sense of urgency and zeal on their part to do something, anything, that would help put an end to tragedies like the one in Parkland and countless others. What I witnessed in my kids and their peers was truly amazing. I watched kids from all across the country, along with those right here in Bethlehem, organize protests, vigils, walk-outs, and other events to raise awareness and try to affect change. I witnessed the chastising by people of the kids who participated in walk-outs, saying they were only doing it because they “wanted the day off”, knowing full well the real reasons why my daughters and their friends chose to participate. I was awed by their passion and determination for affecting change and amazed by the knowledgeable and thoughtful ways in which they chose to express their activism. And I came to know the “kids” of Parkland more every day, through the media and through their activism, and as they prepared to rally people from all over the country to take a stand to end gun violence. 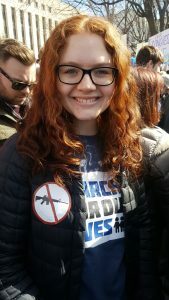 I was fortunate to have the opportunity to participate in a defining moment in these efforts by attending the March for Our Lives Rally in DC with my youngest, Katie. I was overwhelmed by what I experienced and I realized that this generation of young people has a passion for advocacy and an inherent understanding of justice like nothing I’ve ever seen. Their energy was incredible and their message was clear – something must be done. In the months since their efforts have continued to inspire me. Although not much has really changed at the national level regarding gun control since that day in late March, my daughters, their peers, and many young people all over the country have continued their activism on these and other issues. Their ongoing commitment to addressing these issues and putting an end to gun violence gives me hope for the future. Great blog Chan! I finally took the time to read. I was fortunate to have attended the rally in DC with my family. All of us were changed, especially the kids. Thanks!